A Cat Certified Rebuild will breathe new life into your old machine. Not only will it be back to like-new performance and productivity, it'll have a new serial number and comprehensive warranty. After a rebuild you’ll have a machine that's "good-as-new" – but for a cost that’s around 40% less than a new machine. You need the right equipment for the job, at the right price – that’s why you invested in Cat® equipment. If your trusted machine has seen better days, WesTrac can deliver like-new performance with a Cat Certified Rebuild that offers all the benefits of a new machine, without breaking the budget. A Cat machine has more than one life! It’s designed to be rebuilt. When you’ve got a machine you trust, you’ll do what it takes to keep it working hard for you and your operation. Prior to arriving at WesTrac, each Cat Certified Rebuild job starts with a complete machine inspection by one of our field service technicians at your site. Our technician will assess the condition of every component and part to ensure your machine gets the tailored rebuild it needs. This will also allow us to provide you with an accurate quote so you can manage cash-flow. As an authorised Caterpillar dealer, we know how to help you maximise your investment and achieve the highest levels of durability, reliability and productivity. All our Cat Rebuilds are thoroughly tested for quality and operational readiness so that you know your field performance will match those in the shop. To determine which Cat Certified Rebuild Program is the best fit for you and your equipment, get in touch with our team today and we'll walk you through the entire rebuild process and answer any questions. Once your machine arrives at WesTrac it is completely disassembled before being rebuilt with new or reconditioned components from our world class Component Rebuild Centre (CRC). A Cat Certified Powertrain Rebuild (CPT) can help you achieve multiple lives from your machine’s components. Rebuild and update your major powertrain components, offering a cost-effective second life delivering like-new performance, reliability to your machine. A Cat Certified Machine Component Rebuild (CMCR) is suitable if you only need to rebuild specific components on your machine. Our qualified technicians can rebuild and update your engine, torque converter, transmission, differential, axles and/or final drives with the latest engineering updates for like-new performance and reliability. A Cat Certified Hydraulic Rebuild (CHR) Service can restore your machine’s hydraulic and hydrostatic drive systems to like-new and increase their reliability and durability. 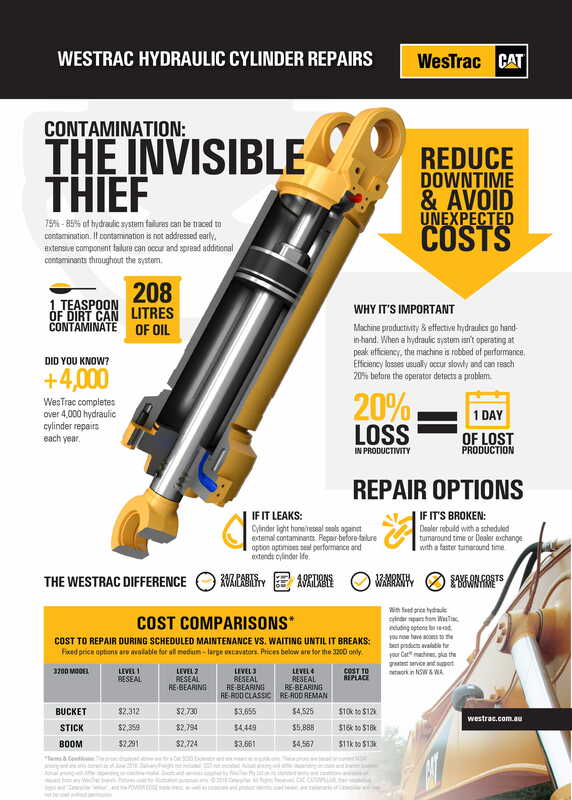 We've created an infographic that highlights how you can reduce downtime and avoid unexpected costs by repairing or rebuilding hydraulic cylinders.